Have you ever felt like catching a wave and riding is until the end? ALL YEAR, EVERY DAY! SURF’S UP! Meet Freeride’s Dream Team and Become a Freerider. Join us for an unforgettable experience! Get ready because Surf’s UP! Join us for some surf lessons and have a great time! Freeride Surf School is in Sagres, the most south-western point in Portugal, Europe! Freeride is the perfect choice for your surf holidays! If you are an absolute beginner or an intermediate surfer you are always welcome no matter what! You will be learning with Freeride’s Dream Team of highly qualified coaches and in the best surf breaks around! All levels are welcome and you can even choose the best option considering your needs! From the group lessons to private lessons or surf guides, we have the best team of professionals ready organize your holidays and to make your life easier even before your arrival! 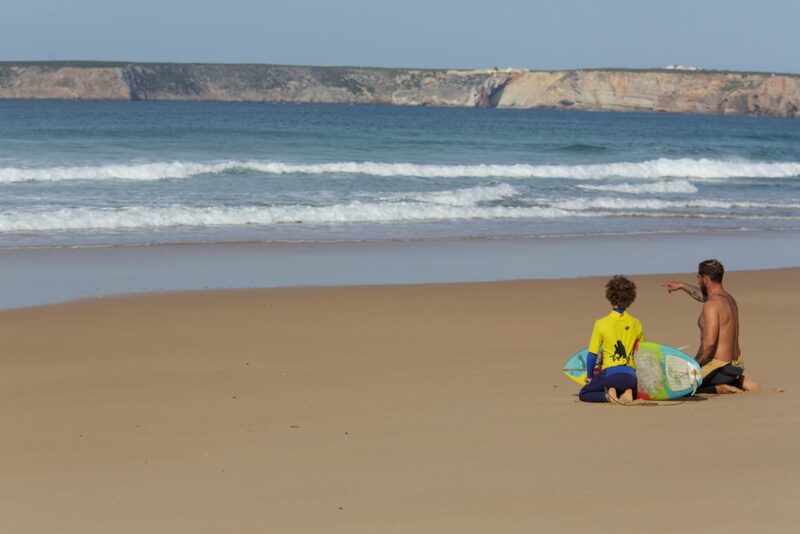 The beaches in Sagres are any surfer’s dream come true as we are located in a Surf Paradise! Being at the very end of the SW Portugal we are right where Land meets the Ocean, surrounded by different beaches, wild nature and the best surf breaks of Europe. The weather is sweet and warm and ready to welcome you to an unforgettable experience. The group Surf Lessons are the more common and the most affordable way to learn how to surf or improve your surfing technique. We have all levels: Beginner, Intermediate or Advanced. The Group Surf lessons are suited for everyone, including children over 12 years old and seniors. The surf lessons will be given with Soft boards for total safety! Learn to surf with with Freeride. Book one or more days of surf lessons and get to know the simple tricks that will get you up and surfing in no time. Get to know basic rules, gear set ups and safety in the water. If you get hooked you can extend your surf course up to 5 days or more! Freeride’s Dream Team is waiting for you! Learn to surf in Portugal with the best and have a blast! 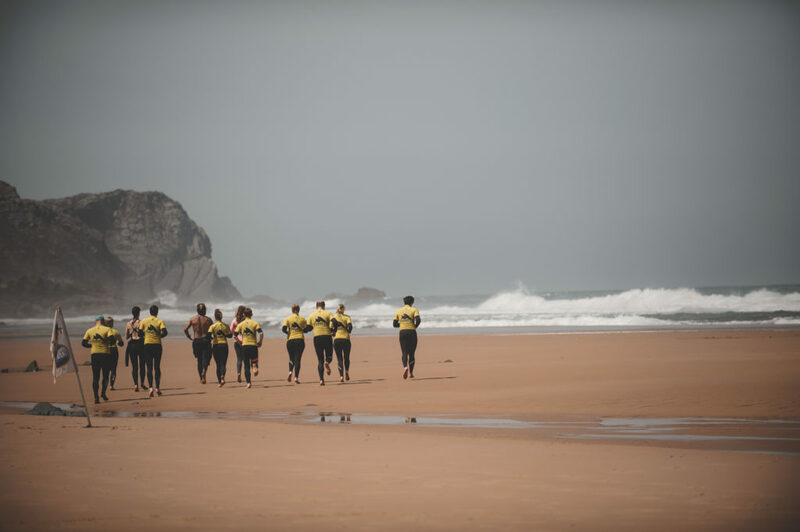 All our Surf coaches are certified Surf Coaches by the Portuguese Surf Federation or by ASI (Academy of Surfing Instructors). The prices shown are per person. These may change without prior notice. If you are staying in Memmo Baleeira Hotel, Pura Vida Hostel or Casa Biota you will have special discounts! Let us know where you are staying! Don’t take chances. Learn to surf in safety with Freeride Surfcamp & School! We take you to the best surf breaks depending on the surf conditions every day. Get all the surf coach attention and make the most of your time with an intensive private surf lesson. Private surf lessons are for every one! Even children from the age of 6! These lessons are like a fast track into surfing. Perfect for beginners to have a quick start on surfing or for intermediate/advanced surfers who are looking for some training in order to improve their surf skills. The lessons for Intermediate to advanced surfers cover a variety of activities designed to improve surfing technique, speed and maneuverability, stance, flow & fitness and give an opportunity for surfers to understand their surfing strengths and weaknesses. 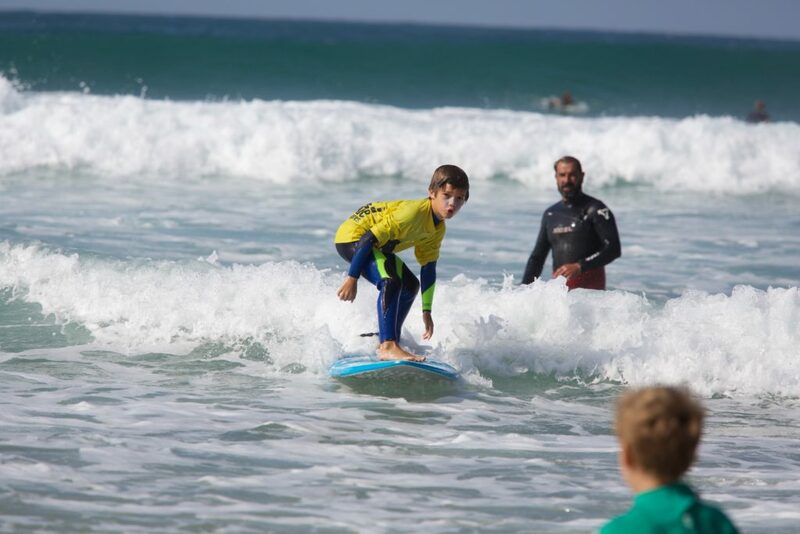 For children under between 6 to 11 years old these Private Surf Lessons are the best way to go! The lessons designed for young children who are excited to learn how to surf have an extra emphasis on the safety of the children while they are having fun. Get all the surf coach attention and make the most of your time with an intensive 1h30 private surf lesson. One-on-one or up until 5 people for one Surf Coach, depending on which type of private lesson suits you best. Talk to us so we can better help you with your booking! * No extra person allowed on the Private Surf Lessons for 1 or 2 pax. ** For the Family or Friends Private Surf Lesson every extra person is extra €55. Maximum people 4pax per coach if there are any students younger than 12years old. If older maximum is 5pax per coach. Levels must be the same otherwise you have to request an extra coach for extra €55. Are you an advanced surfer and just want to get to know the surf breaks? Get your own private surf guide, transport and surf gear (if you don’t have your own) and go on a adventure to surf the best spots according to your surf skills and expectations. Come alone or with a group of friends and start your Surf adventures discovering the most amazing surf breaks in the Algarve without any hassle. Freeride Surf School – Hotel Memmo Baleeira, Sagres – every morning, all year at 09H15. Freeride Beach Hut – Praia da Cordoama, in Vila do Bispo – June to September at 10H30. Notice that schedule can be changed, due to tides or meteorological conditions. For Private lessons or Surf Guides please check your booking details with us! At Freeride we believe that a good surf school is the easiest and fastest way to learn and/or improve your surfing. with an intensive surf course you’ll have a bigger chance to improve in a shorter period of time. We recommend a 5 day intensive surf course (including 3 hours of lesson per day and all the surf gear) to start with and after you always have the possibility of extend it for more days. To book or for more info please email us at info@frsurf.com or contact us through +351 918 755 401 – also available on Whatsapp. When you purchase our services you are agreeing to our terms & conditions. We have all the surf gear you might need available for rental! You can rent straight at Freeride Surf School in Sagres during the office open hours. From June to September you can rent also at Freeride Beach Hut at Praia da Cordoama in Vila do Bispo from 11h30 to 18h00. Describe the Surfing Experience level of everyone in your group. Surfing experience required! You are responsible for your own safety in the water. Yes, I will bring my own board. No, I need a board.